The topic of unconscious bias is in the news regularly. Eclipsing that concept is this state of “politeness,” where we’ve learned to stop being judgmental and assumptive. The reality is that there is a middle ground – that place where judgements and assumptions can result in ensuring our safety AND where we can push back on autopilot and choose to reconsider and evaluate our choices. We are going to discuss the topic of judgement, assumption, and bias at the Women’s Leadership Roundtable. There is a misconception about actual representation of women in media. Gender representation in the media has influence and is favorable to males. The biggest gender gap is at the first step to becoming a manager: entry-level women are 18 percent less likely to be promoted than their male peers. 25% more women feel that their gender will make it harder for them to get a raise, promotion, or chance to get ahead than their male counterparts. Analyzing our own biases is the first step to understanding how we may be getting in our own way … in addition to limiting the success of our professional relationships. Researchers are investigating how our brains respond, and there are findings that show unconscious bias on MRIs and that when we run auto-pilot too much we make poorer decisions. 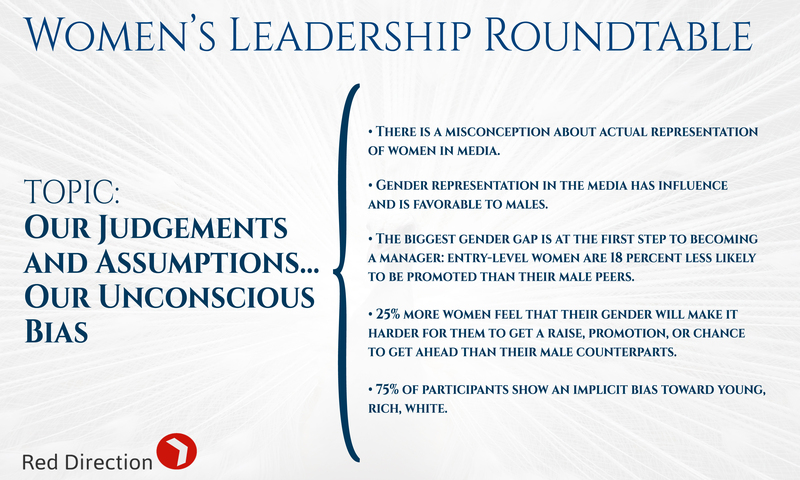 Discussing unconscious bias at the Women’s Leadership Roundtable continues to put our attention on it. We have the best intentions, yet can still limit ourselves and others by the words we use and the assumptions we make. Our internal stereotypes come from what has been modeled to us, and what we experience first hand. Talk about our experiences and work on ourselves. We must be honest that we are biased, and that those unconscious reactions (that exist to make our existence more efficient) may limit us and others. Do our own internal work, first. Become aware of what we do and call ourselves on it. Actively discuss that unconscious bias exists and that we may choose to engage in active, unbiased thought. There are many that choose to accept a role, and even fight against it in an attempt to make change. By watching and observing ourselves, we can find out if we are one of the many. It’s the few we lookup to, we see as our role models that made a shift to a new place: a place of acceptance that everyone has unconscious bias. That there is effort to shift awareness and then fiercely hold on to it. Be a champion for other women. Evaluate advice differently from our champions and mentors. Lead from an example of awareness. Subscribe to the Women’s Leadership Roundtable.